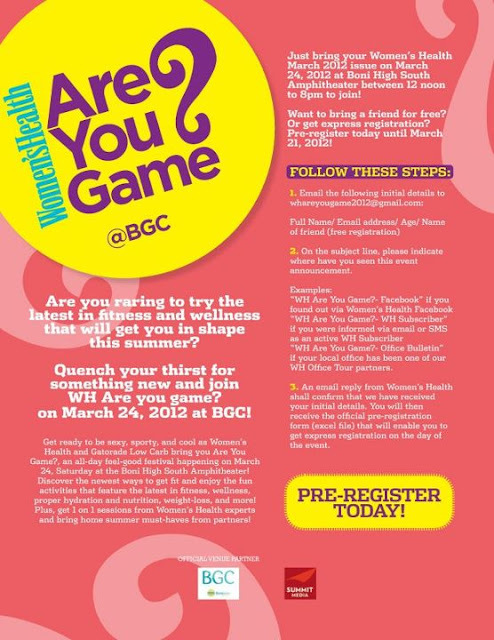 Women's Health magazine and Gatorade Low Carb presents "Are You Game? ", and all-day feel-good festival which will happen on Saturday, March 24, 2012 at the Boni High South Amphitheater. The event is designed to show you the latest in fitness, wellness, proper hydration and nutrition, weight loss and more. You can also have 1-on-1 sessions with Women's Health experts and bring home summer must-haves from the event partners! 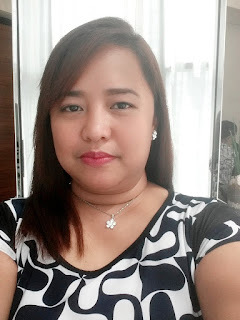 Want to join the event? Just bring the March 2012 issue of Women's Health and be there anytime between 12 noon to 8pm. You may also bring a friend or get express registration by pre-registering today until March 21. Email your full name, email address, age, and the name of your friend to whareyougame2012@gmail.com. An email confirmation will be sent and it will contain the official pre-registration form that will enable you to get express registration on the day of the event. For more information about the event, please visit http://www.facebook.com/womenshealthphilippines.